One of the most exciting things about being a textile conservator is that it allows one to closely observe the way an item is constructed and what it is made from. Often there is a surprise in store particularly when an unusual material is used. 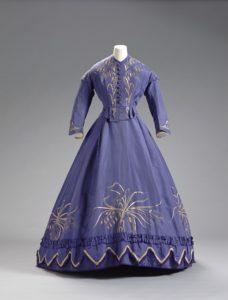 In 2011 when RAMM reopened after its redevelopment a stunning purple two piece day dress of the late 1860’s was put on display. The interesting thing with this particular ‘dress’ was the embroidery material used to decorate the bodice and skirt – straw. We know very little about this dress. Who wore it, who made it and even where it was made are speculative. It was thought to be French but there is a dress in the Galleria del Costume dib Palazzo Pitti that is reportedly Italian and is very similar in colour, style and date. Straw used in the bonnet making industry was quite common when RAMM’s dress was made in the 1870’s. The straw in England (mainly a bread wheat Triticum aestivum) was split by drawing the hollow shaft through a hole sectioned off with numerous metal cutters so the shaft was cut into splints varying from about three to nine. They were then bleached with sulphur fumes and flattened before being plaited and the plaits stitched together to make the bonnet shape. Straw embroidery is still something of a mystery. Why use straw? Described as ‘poor man’s gold’ it might be cheaper than gold but possibly more difficult to work with and certainly less robust. The large skirt worn over a crinoline would brush against doors and furniture; over time it can become brittle and then easily damaged by cracking. It is ironic that the embroidery on RAMM’s dress depicts ears of wheat, wild oats and grasses but designs of the time show a fashion for botanical images. 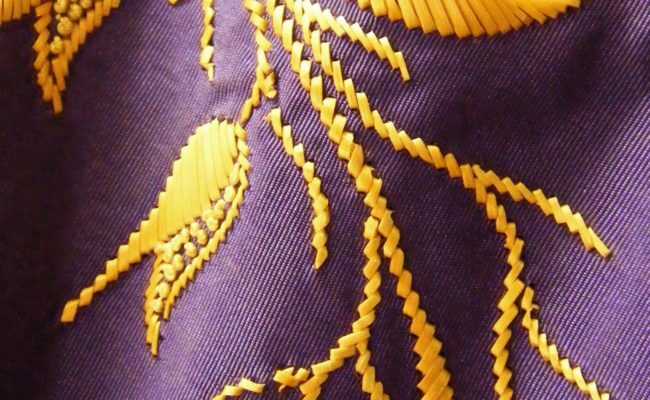 Detailed analysis of the straw used for the embroidery has not been carried out but if the dress was made in Italy would the straw be the finer Triticum turgidum used in the Italian straw plait industry? The straw here in this dress is also split and worked as an embroidery thread but how it was embroidered throws up more questions than answers. 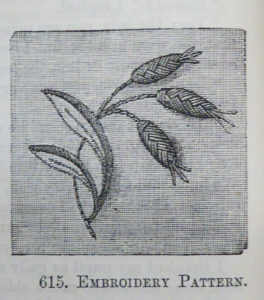 We can see the design has been drawn with a white pencil or crayon and the straw worked directly through the silk fabric. This would have been difficult to do without damaging the silk and unlike many forms of embroidery there is no re-enforcing layer underneath. Before plaiting straw it needed to be soaked in water to make it pliable enough not to crack. This would need to be the case here but why are there nor tide marks on the silk caused during drying? Straw is not the most ideal material for use in costume. 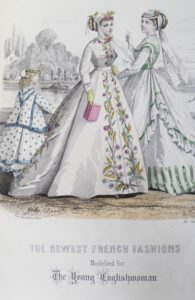 The large skirt would brush against itself, doors, carriages etc. Over time it can become brittle and then damaged easily by cracking. This reminds me of fairy stories when straw was spun into gold. Could there possibly be a connection? You are missing two very important elements in the preparation of the straw! Before the straw was split it would have been bleached using sulphur. This softened and brightened the colour of the straw. After the straw was split, it was passed through a mill (mangle) NOT to flatten the splints, but to compress the pith on the inside of the straw. By compressing the pith the straw becomes much more flexible. Once these processes are complete the straw splints become very soft and flexible. Simply to damp the straw would not make them easy to work. Once slightly damp if the tip of the straw is cut to angle angle it is possible to stitch without using a needle. Of course you would need to first make holes in this closely woven silk with a stiletto. Using this technique you would not find water marks on the silk because very little water is required. As to origins of the work it is more likely, based on the evidence of other surviving objects, to be from France. 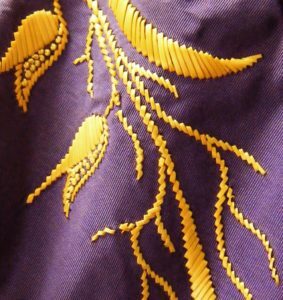 Italy is not known for embroidery, they. were producing hats and working with the Swiss industry to produce straw products for them. Having said this is more likely to have made embroidered in France should not rule out the possibilities that under the instruction, or following training from a teacher from France, this costume wasn’t made in another country. It really is important to understand the properties of straw and how it was prepared, to understand how on earth this beautiful work was produced as a commercial enterprise. You say about straw not being sturdy, but when properly prepared it is incredibly robust, probably as robust as a metal embroidery thread. I hope this information helps your understanding of this amazing material. Veronica Main, author, Swiss Straw Work – Techniques of a Fashion Industry. Formerly Significant Collections Curator, Luton. thank you for all that information. I think RAMM might have tried to get in touch with you in the past about this piece but not managed it. Our costume curator will be in touch with you shortly by email. Concerning the possible connection to fairy tales… No. There is no evidence to support this charming thought. 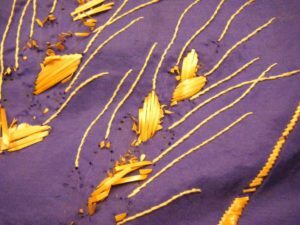 The term straw into gold more likely reflects that you could take a humble material and turn it into a commercial product which earned money for the worker.